If Muhammad Ali was an investment strategist, he may have said, “An investor that views the stock market in 2018 as they did in 2017 has wasted thirty years of market data.” At Noble Wealth Partners, do we view 2019 as we did in 2018? No, but we see some themes that may repeat. In 2019, we expect continued volatility, geopolitical risks, and dysfunction in Washington (shocking, I know). Those themes make us question, “Is this the end of a historic bull market that began in March of 2009?” That is always a possibility. Economic data is waning, cash rates above 2% are attractive, and earnings growth is falling as the tax benefit rolls off and global growth peters. However, 2019 separates itself from 2018 with attractive valuations and a dovish Fed. Furthermore, the yield curve has not inverted, most countries are still in expansion mode, and the Leading Economic Index® is still giving us a green light. Is the stock market pulling a “rope-a-dope” on investors? Or, is the stock market down for the count like George Foreman after the Rumble in the Jungle? Before diving into what lies ahead, let’s take a look back at 2018. The stock market kicked off 2018 with the best start in 31 years up until January 24th. According to Bespoke Investment Group, when the stock market is up over 5% by January 23rd, the index’s median gain for the rest of the year has been 11.6%. At this time, the S&P 500 had only three down days in 2018, the lowest number since 1987. In fact, the S&P 500 went 310 trading days without suffering more than a 5% pullback, the longest streak on record. Investor sentiment was near record highs just prior to the first 10% drop since early 2016 which began on January 26th. This correction stunned investors. The economy was moving in the right direction, rates were low, the labor market was strong, and corporations were reporting stellar results. For those reasons, the stock market was resilient and investors seized the opportunity to buy the dip. By late September, the S&P 500 had once again hit new highs. Only this time around, global growth was slowing, geopolitical risks were surfacing, Theresa May was struggling to execute a clean break from the European Union (how could she not), trade tensions were escalating with China, angst over an aggressive Fed emerged, and the financial results from companies in the S&P 500 (and around the world) were staring to show signs of cracking. As the tailwind from the 2018 Tax Reform rolled off, earnings growth was expected to decelerate by more than 10% (FactSet). This time, there was good reason to be cautious. Still, the talking heads on Wall Street and broker/dealer firms pontificated the strength and durability of the stock market. You can see an interview on CNBC explaining why the research department at LPL Financial believed October was going to be a strong month for the stock market. Well, the talking heads were wrong. Beginning in October, the stock market began its descent. Still, market pundits continued to encourage optimism in an attempt to unnerve their clients. Take a look at this chart showing that December has never been the worst month for a calendar year going back to 1950. Be careful of the work never. Here, the word was a harbinger of what was to come. In 2018, not only was December the worst month of the year, it was the worst month ever going back to the Great Depression in 1931 (Wall Street Journal). From the record highs reached in late September, the stock market cascaded until Christmas and had lost around 20% of its value. Thankfully, Santa was kind enough to help the market out of the chimney and rally until the end of the year to recoup some of its losses. In the end, this was a sleigh ride I would prefer to sit out. A chart of the S&P 500 in 2018. The two shaded areas indicate the corrections that occurred. It was unique for the stock market to end in the red after a seemingly positive start. In fact, the last time the Dow Jones Industrial Average ended the year in negative territory after being positive through the first three quarters of the year before Monday was 1978 (Dow Jones Market Data). The year was 1948 for the S&P 500 and 1987 for the Nasdaq (Wall Street Journal). Investors were quick to eschew the stock market. 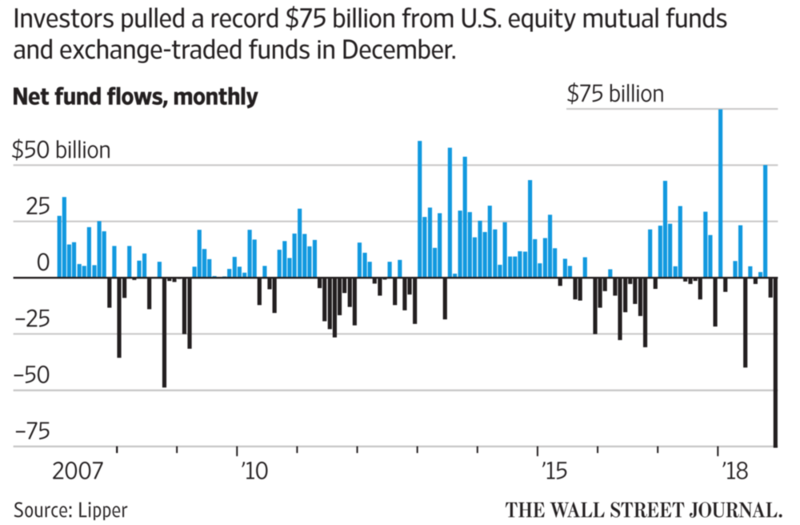 In December, investors yanked $75.5 billion from U.S. mutual funds and exchange-traded funds that track stocks, the biggest exodus from stock funds in a single month ever using Lipper data going back to 1992. In 2018, market participants were also flabbergasted with market volatility. Yes, I said volatility. Investors may have forgotten what that word means, and for good reason. In 2017, the S&P 500 only moved up or down 1% or more eight times the entire year, tied for the third lowest since 1928. Furthermore, the S&P 500 returned 21.8% in 2017. In 2018, the benchmark S&P 500 swung more than 1% in either directions 64 times and ended the year in negative territory (Zacks). While 2018 was a year to remember in the stock market, the volatility was only slightly above average on a historical basis. The 64 days of 1% market swings in 2018 is not far from the post 1928 average of 60. The issue is that 2017 had the fewest 1% moves going all the way back to 1965. However, the stark contrast between 2017 and 2018 made the volatility difficult to endure. How do we view 2019 and what are the key themes? I think it’s a good idea to remember that corrections, drawdowns, pullbacks…whatever you want to call the market going down - is healthy. When the prices of stocks go down and the fundamentals remain intact, valuations on the stocks go down. Meaning, they’re on sale. Predicting future market returns can be a daunting task, but it’s fair to say when stocks are expensive, future returns are less attractive. When stocks are cheap, future returns look more attractive. It’s a simple, yet important relationship that is often overlooked. The Price to Earnings ratio, or P/E ratio, is a common way to calculate the cost to buy ownership in a company. To the right, you can see that prior to the downturn, the S&P 500 was trading at a price that was 18.5 times next year’s expected earnings. Placing this broad measure of stock market valuations in the 86th percentile against its own history, a rich value. You can see other classes were also trading at frothy levels. After the ~20% collapse in the stock market, valuations are looking fair as they trade in the 42nd percentile. When considering the muted interest rate environment, one may assert that valuations appear attractive. We observed a 20% decline in the P/E ratios of the stocks within the S&P 500 last year. Did the stock market just go on sale? In the past, how has the market responded to P/E multiples declining 20% or more? 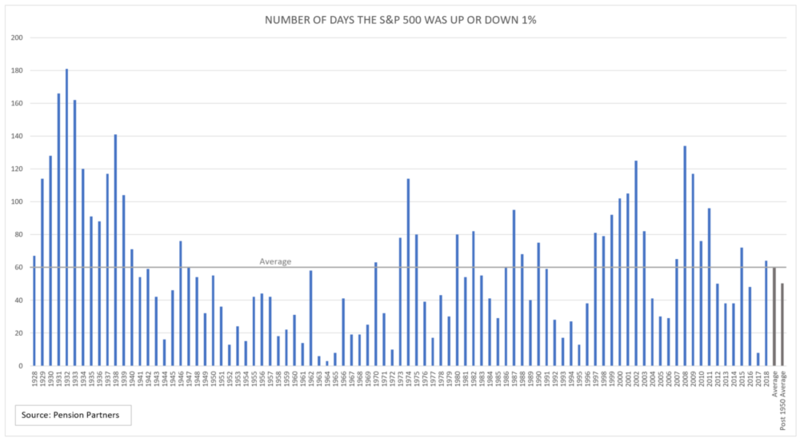 Well, it’s happened 20 times in modern history and, on average, the stock market goes up about 12% over the next 12 months and has been higher 15 out of the 20 times - a 75% batting average. While the stock market can seem intimidating from distance, it’s not much different than any other market. People buy stocks, stocks go up in value, euphoria ensues, stocks get too expensive, panic ensues, stocks go down in value, people see bargains and start buying again. As the saying goes, the cure for high prices is higher prices. Nothing goes up in value forever, and nothing goes down in value forever. With the almost-bear market in the rear-view mirror, will investors seize the opportunity to buy stocks at these valuations? First and foremost, expect more volatility. It is normal for volatility to remain low in the early stages of the economic cycle. However, once the Fed begins raising rates, credit conditions deteriorate, valuations rise, and the market is long in the tooth, volatility tends to increase. This is the time when investors that may have confused brains with a bull market find themselves questioning their approach. Volatility is not always bad. It can create opportunities as the performance of asset classes disperse. At this juncture, professional investors can distinguish themselves from the amateurs. Where would one even start? Well, we’ll go with all the things that are concerning around the globe not in our own backyard (we’ll get to that in a second). How about China? China is on everyone’s mind because their economy is slowing rapidly and a trade deal with the United States continues to sit in limbo. China is the world’s second largest economy, and the United States imports the vast majority of it’s finished manufactured goods, with Europe not far behind. Due to an extraordinary amount of financial leverage in the country, a recession in China would almost assuredly come with another financial crisis. Peachy, huh? A recession in China, amplified by a financial crisis, would constitute the third leg of the debt supercycle that began in the US in 2008 and moved to Europe in 2010. Up to this point, the Chinese authorities have done a remarkable job in postponing the inevitable slowdown. Unfortunately, when the downturn arrives, the world is likely to discover that China’s economy matters even more than most people thought. We could also add a heaping helping of Brexit to go with the main course of a potential China recession/financial crisis. While the initial vote for Brexit caught many off guard, the chaos that has ensued since the special election has been down right predictable. According to many polls following the Brexit vote, the majority of British citizens almost immediately regretted their decision once the vast implications of Britain’s withdrawal from the European Union became known. Theresa May was left with a nearly impossible task of negotiating her way out of the European Union. But the EU is not going to make it easy. Yes, they want to protect their mutual interests, but they also want to send a message to other countries like Italy, Greece, and Portugal that leaving the European Union could have a crippling impact on their economy. 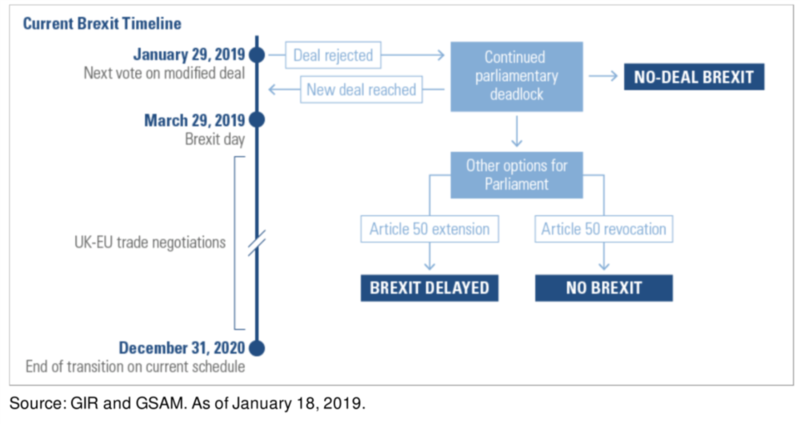 On March 29, 2019, the UK is expected to leave the European Union. It has been more than two years since the election and progress toward a resolution is moving slower than Tom Brady on a QB sneak into the end zone. Theresa May’s leadership is being questioned and the two sides remain far apart on any compromise. The next two months are going to be a bumpy ride. You could review investment commentary from almost any firm in any given year and have “dysfunction in Washington” be an issue that everyone was keeping their eyes on. S.S.D.Y.…Same S**t, Different Year. Will we fund a wall along the border? Will the government open up for business this year? Do any elected officials remember who they actually work for? Hint: it’s us. Despite all the negativity, the economy continues to chug along, even though it’s at an ever slowing pace. There is little argument that we’re anywhere but at the end of a very impressive economic expansion, the 8th or 9th inning if you will. What we don’t know is if this particular game intends to go into extra innings before the next recession hits? The Federal Reserve has been under enormous pressure and scrutiny from the media, the President of the United States, and every investment professional on Wall Street over the past few months. The reason? Being tone deaf to a market that isn’t signaling any inflation and is starting to show signs of weakness. Despite those characteristics, and threats from Donald J. Trump, Fed Chair Jerome Powell continued to raise interest rates. Can the economy handle a fed funds rate that starts with a “3” handle? Right now, it’s getting pretty skittish at 2.5%. And the Fed is starting to indicate that they hear the cries for them to slow down, with several signals pointing to them backing off this year. Good news here, a more dovish Fed delays the eventual inversion of the yield curve. At present, the yield curve has not inverted, but it is close. 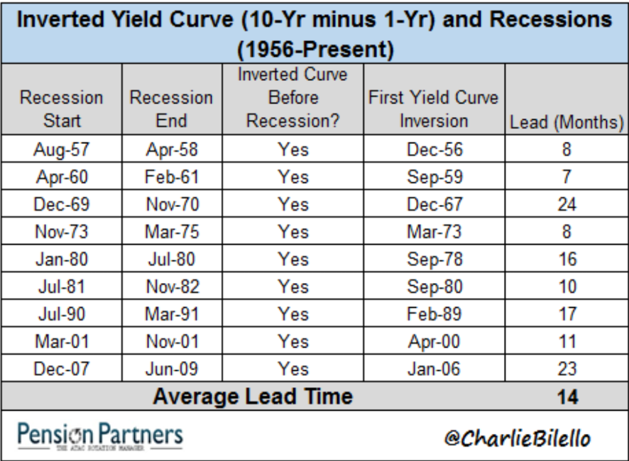 When should we expect a recession once the yield curve inverts? Since 1956, the average lead time has been 14 months. In the past, investors have had adequate time to react once this omen occurs. The Conference Board’s LEI (Leading Economic Index) is one of the most-followed forward economic indicators in the financial world. This index is a monthly economic series that tracks the changes in economic performance in the United States. The LEI considers ten forward-looking economic indicators and models the changes in these indicators to construct the index. This index can be a reliable forecasting tool for recessions as year-over-year growth in the Conference Board’s Leading Economic Index has turned negative prior to the last seven recessions. This index is still showing year-over-year growth as of January 2019. As long as this indicator is flashing a green signal to the market, investors should be fairly confident we are not tipping into a recession over the next twelve months. Quick! What was the best performing asset class in 2018? Did you say cash? You’d be correct. For the first time in 10 years, cash outperformed all other asset classes across the board. We never thought we could be so excited about U.S. Treasuries over 2%, but here we are. 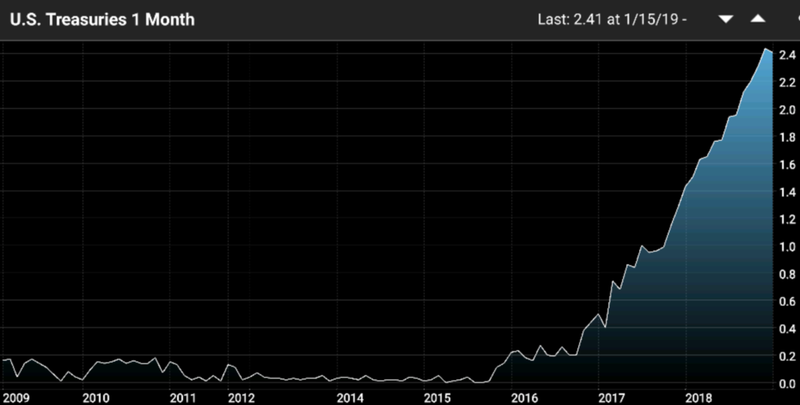 The long battle cry that the Fed was punishing savers with it’s zero interest rate policy (ZIRP) has been replaced with the battle cry that the Fed doesn’t pay enough attention to the stock market. You can’t make everyone happy all the time. If your bank is not paying you over 2% on your cash accounts. Call us, we can help. The world around you is constantly changing, and so should your portfolio. Natural selection has taught us to continue behaviors that reward us and cease any behavior which may cause us harm. For investors, it is a natural instinct to want to hold investments that have done well and sell the under-performers. Unfortunately, this strategy can be problematic as investments have displayed a tendency to mean revert. 2017 was a good year for investors. Evolution would tell you to stay invested and you would have been penalized. 2018 was a troublesome year for the market, but don’t sell your investments just yet, the stock market may be pulling a “rope-a-dope” on us. Don’t forget to use the lessons we have learned from the past. Let’s use Muhammad Ali’s wisdom, and go into 2019 with a different lens and a new perspective. Did Your Life Insurance Policy Kill Your Financial Plan? Did Your Advisor Put a Debt-Bomb in Your Portfolio?